Now this is definitely something you won’t see every day so I took the opportunity to immortalize it with a screenshot. 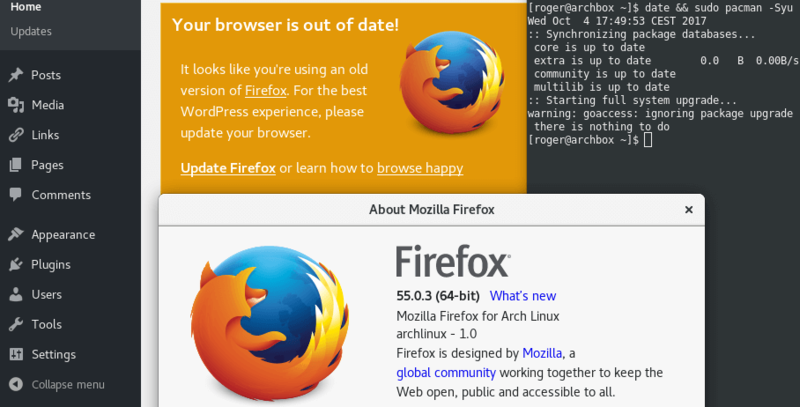 The package being “flagged” as out of date by WordPress is Firefox from the Arch extra repository. Apologies if I made some people choke on their coffee, I speak half in jest, half in earnest. I do expect shiny stuff on Arch and Firefox 56 is already marked as stable in Fedora’s repository. Do I simply find myself in the wrong bleeding edge camp these days I wonder? I was spending an evening window shopping for a future BSD hosting provider when I came across ARP Networks and its list of VPS plans. What caught my attention was not the technical specifications, but rather the naming scheme that I found to be simply astounding. So I noticed this new "Recrawl now" link that had suddenly appeared in Google Search Console (beta edition) and was immediately enticed. The result however was not what I had in mind. I can deal with being fooled on April Fool's day, but getting Rickrolled in 2018... now that's just pure evil. Anyhow, enjoy an animated gif of Google's trolling below. Are you currently unsatisfied with your Linux distribution? Perhaps it's time to consider a distribution that offers more than a different selection of wallpapers. Make your Linux experience great again by choosing one of the following operating systems.